Disneyland: Continuing her birthday celebration, Amy flew with Jan and Sofia to Disneyland for three long days of fun (and sunshine, thank goodness!). It was wonderful to introduce Sofia to the Happiest Place on Earth. 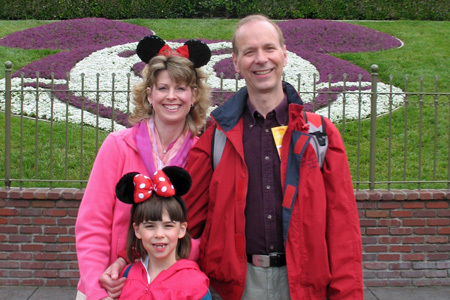 She rode every ride, big and small, enjoying everything from Space Mountain and the Matterhorn to It's a Small World. Her favorite inside Disneyland was the Buzz Lightyear Astro Blaster. It was the first time for all of us inside California Adventure. Sofia and Jan rode at the very front of the California Screamin' rollercoaster! She liked it, but of all the rides there, Sofia's favorite ride was Hollywood Tower of Terror! One night we viewed the Disneyland fireworks from the hot tub of the Howard Johnson hotel; another evening we watched the amazing California Adventure Colors of the World display. Our third night was a very special birthday treat, as friends Elisabeth and Evan drove all the way down from San Jose to have dinner with us. Although our feet were tired, all in all the whole weekend was a blast for young (see Sofia's album) and old(er). The Big 5-0: Half a century! How is that possible?! Amy celebrated her big day by hosting a birthday dinner at The Melting Pot in Bellevue for a group of eight family and friends. The four-course dinner included a starter of three cheeses with apples and bread, salads, various meats and vegetables cooked in broths and oils, and for dessert, three kinds of chocolates for dipping fruits, pound cake, and marshmallows! Heaven! Cooking and eating it all took three hours, making the dinner not just a meal, but an event! Cameron turns 19: In late April Cameron turned 19. He spent his actual birthday taking college mid-terms, but he managed to celebrate with family and friends the following weekend. His choice of gifts has changed now that he's in college: at the top of his wish list were a mini-fridge for his fraternity room (down from six roommates during fall quarter to just three roommates for spring quarter) and a waterproof, windproof jacket for biking to classes on campus. "E.B." visits: Last Easter Sofia and Jan were in Holland over Easter. This Easter they were back home again, and even Cameron was home from his fraternity. Sofia went to bed the night before willingly because Amy reminded her that the Easter Bunny ("E.B.") would not visit unless she was asleep. But she was so excited that she woke up at midnight, sure that she'd heard E.B. walking around downstairs, and again at 3:00 in the morning! She finally got up at 7:30. The Easter Bunny did come, of course, and left eggs hidden around the house and baskets for Sofia and Cameron at the kitchen table. Sofia's current theory about E.B. is that he's not a real rabbit. That's because a real rabbit doesn't have hands or fingers to make chocolate or carry baskets. Instead, she's very sure that E.B. is a person in a bunny suit. 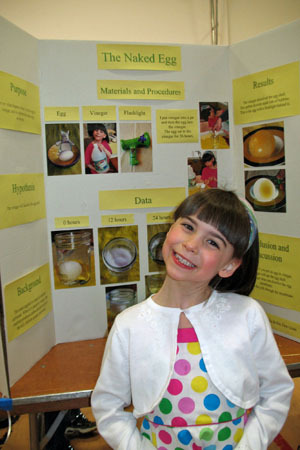 Budding scientist: On April 19th, Sofia presented her very first Science Fair experiment at school. With Amy and Jan's help, she conducted and documented an experiment called "The Naked Egg" in which she placed an egg in a jar of vinegar and waited to see what would happen. To her amazement, the vinegar ate away the eggshell, producing lots of carbon dioxide along the way, leaving the membrane intact. With a flashlight behind the egg, one could then see the yolk inside. That's the part she liked best. She presented her project to her classmates and received a certificate and ribbon of participation. Sofia and her Naked Egg presentation. Finally some clear sky! In early April, Amy, Jan, and Sofia took a long weekend trip to Cannon Beach and Portland, Oregon. The weather forecast had been for clouds, low temperatures, and likely rain. Thank goodness the meteorologists were wrong! For the first time in ages, we woke up to crystal clear skies. The air was still nippy, but it was so great to see the sun after what felt like months of dreary gray skies!! We spent two days exploring Cannon Beach and playing at the RV resort's heated pool, then two days with dear friends Dave and Jeanne in Portland. Maybe spring is actually on the way! 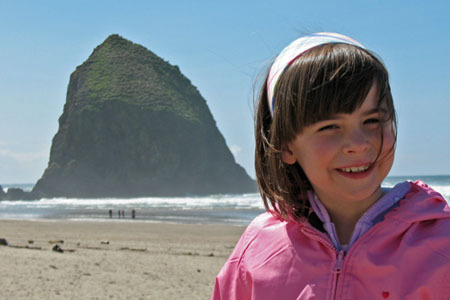 Sofia in the sun, with Haystack Rock, the " world's third largest intertidal monolith," behind her. (Wow, then Sofia must have a really big head!